Hey tea lovers, can you handle a bit of counterintuitive advice on a hot summer day? The next time it's really hot outside and you want to cool down, brew yourself a hot cuppa' tea. Then — and only then — are you allowed to ask yourself if you feel any better. Any cooler. Any more refreshed. We're not going to hand you an answer to this one; we simply want to point out that in lots of places around the world where people live in hot weather, tea is not routinely served over ice just because it's more than 80 degrees outside, like it is here in the United States. And we obviously have nothing against iced tea — in fact, we love it! We've created several delicious flavors, in fact. But did you know that studies have been done on how drinking warm beverages can help keep you cool? We found out about one of those studies at Smithsonian.com. It all seems pretty logical: you increase your body heat when you drink warm beverages, but that also helps you produce more sweat. As you might remember from your 7th grade health class, the entire purpose of sweat is to evaporate in the air, thus cooling the body. It turns out that researchers have found that if all of the extra sweat you produce by drinking that hot beverage can, in fact, evaporate, you'll more than compensate for the added heat to the body that comes from the hot liquid in the first place. Of course, first you have to be willing to sweat. That means you have to be wearing clothes that allow your skin to breathe (aka tank tops and shorts - HELLO, SUMMER WEAR!) and then you have to be in a climate where that sweat is likely to evaporate. So, if it's super humid outside and your sweat isn't likely to evaporate efficiently, too bad for you. Sorry, East coasters. Up here in the Rocky Mountains of Colorado, we compare this effect to hiking up a steep hill in the full sun. You know you're going to sweat all the way up, but you also know when you reach the top and head downhill, boy is that breeze going to feel fantastic. And look, we've found we never have to work too hard to get a bunch of tea lovers to drink more tea, hot or iced. So give this a shot the next time you really need to cool off, and let us know if it works for you, okay? Cheers to summer! The Protein Tea your Paleo diet can’t do without is finally here! People are all abuzz and aflutter with news of our new tea! As part of your everyday, healthy Paleolithic lifestyle, we're proud to announce our latest organic tea creation, Protein Tea: A Paleo-Friendly Blend. Two Leaves founder and CEO Richard Rosenfeld is fond of saying the new tea includes “a little something extra”, and it does — a lot of little extra somethings. For maximum protein power, this paleo tea is primarily comprised of tiny insects, sourced from within the United States. Although Rosenfeld notes you would actually have to take the bugs out of the sachets and eat them to get the full protein benefits, there’s probably nothing more Paleolithic than that. “You’ve got to figure that cavemen and women were so hungry, they were probably eating and drinking just about anything that didn’t kill them. If a bug or two crawled into their food and drinks now and then, I’m sure they didn’t mind,” he says. Entomophagy — the human consumption of insects as food — has been receiving widespread publicity in the past several years, and growing in popularity as a result. According to a 2013 report from the United Nationals Food and Agricultural Organization, there are more than 1,900 edible inspect species on earth, and two billion people in the world eat a wide variety of insects regularly. The bugs are packed with protein fiber, good fats and vital minerals. Rapper Nas recently invested in Exo, a Brooklyn-based company that makes protein bars out of crickets. ALL of the good stuff is in this tea -- wings and all. Other ingredients in each sachet include small amounts of the herbs that the insects were feasting on when they were harvested in completely organic fields. Two Leaves and a Bud has long been a company that seeks out tea ingredients from gardens where pesticides are not sprayed; this time the company sought out conventional farms growing plants that typically attract plenty of insects, like caraway, alfalfa, fennel and spearmint, and asking farmers not to use chemicals to ward off the bugs. Rosenfeld saw it as a chance to change the pesticide using practices at a few conventional farms in the process of sourcing tea. APRIL FOOL'S, tea lovers! You know us -- we can't resist a good joke. And if you read this far in this blog post, there's something in it for you: 20 percent off of your order on our website today, by using promo code ProteinTea16 at checkout. Let’s make resolutions for Hot Tea Month! We resolve to be this efficient while pouring tea during National Hot Tea Month. As a reader of a tea blog, we think it's safe to assume that you drink hot tea regardless of the weather, like we do, and definitely not just when its super cold outside. But maybe you'll play along with us as we suggest we all make one firm resolution for Hot Tea Month: Try something new! Do you always steep your tea in a sachet or teabag? Try it loose! All you'll need is a simple filter basket and some loose tea leaves, and you'll discover an easy way to customize the strength of your brew. Break up your tea habit a bit: add the milk <gasp> before you add tea to your cup, and see if you taste a difference. Stir in agave instead of honey. Try a flavored sugar, like vanilla sugar. Steep for a minute more or less! Stir counter-clockwise instead of clockwise! The possibilities are endless. We wish you all a happy National Hot Tea Month, and a wonderful 2016 while we're at it. Cheers, tea lovers! Fair Trade and Non-GMO? We’re down with that. October is both Fair Trade Month and Non-GMO Month, and so now's a good time to tell you tea lovers: when you drink our tea, you're celebrating these causes with us, whether it's October or not! 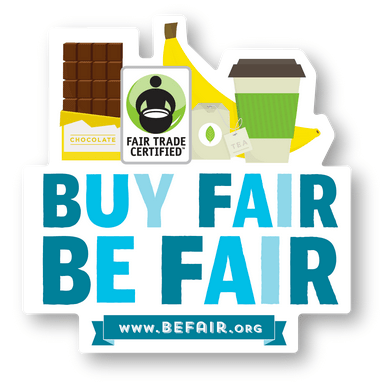 We suspect you know all about Fair Trade, but just in case you don't, we'll tell you that it's all about paying people fairly for the work they do. And your favorite beverage is a great example of how many people work hard to bring it to you, and sometimes aren't paid very much at all. Fair Trade USA was set up to stop that from happening, and Two Leaves and a Bud happens to be a certified business with Fair Trade USA. We don't always use Fair Trade USA with some of our teas, though — for our Two Leaves and a Bud tea sachets and loose teas, we pay top dollar directly to tea gardens to bring you the best whole leaf tea we can find. While these teas aren't certified by a third party, we are trading fairly! We pay more for our tea, and that goes to back to the gardeners. Most of our teas from our range of paper tea bags — Paisley Label Tea — feature blends of teas from various gardens, so we buy Fair Trade Certified tea for those teas to ensure that all the growers receive a fair wage. Those teas are certified by Fair Trade USA. As for our alliance with the Non-GMO (Genetically Modified Organisms) Project, consider that since we place a priority on knowing that our teas are organic, so we know exactly what's in the tea before we sell it to you, of course we're not interested in choosing GMO ingredients! We share the Non-GMO Project's vision that everyone deserves an informed choice about whether or not to consume genetically modified organisms, so seeing their logo on our boxes should put your mind at ease. So, sip some fairly traded, Non-GMO Verified tea with us all year long, tea lovers! For more information on these organizations, visit fairtradeusa.org and nongmomonth.org. Cheers! Raise the roof for Rooibos! So red, it must be Rooibos. 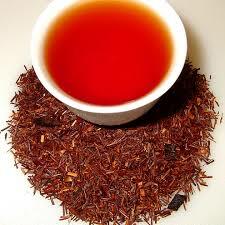 Rooibos is primarily grown in South Africa, and is practically a national drink there. It's also called "Bush Tea" or "Redbush Tea" - especially in the UK. What is it, exactly? It's a kind of herbal tea, meaning it doesn't contain any leaves from the camellia sinensis plant. The Rooibos plant itself is a member of the legume family, has little needle-like branches and pretty yellow flowers. Don't be intimidated by the name, just say "Roy-bos" and you'll sound like a pro. Rooibos doesn't have caffeine, but it does have all sorts of other great things, like polyphenols, which get a lot of attention because these macronutrients may have an important role in preventing cancer and cardiovascular disease. Our own sachets of Rooibos, which we call Organic African Sunset, include just a touch of lemongrass to brighten up the flavor a bit. Since South Africa has hundreds of commercial rooibos growers, quality control is quite important to the South African Department of Agriculture, Forestry and Fisheries. 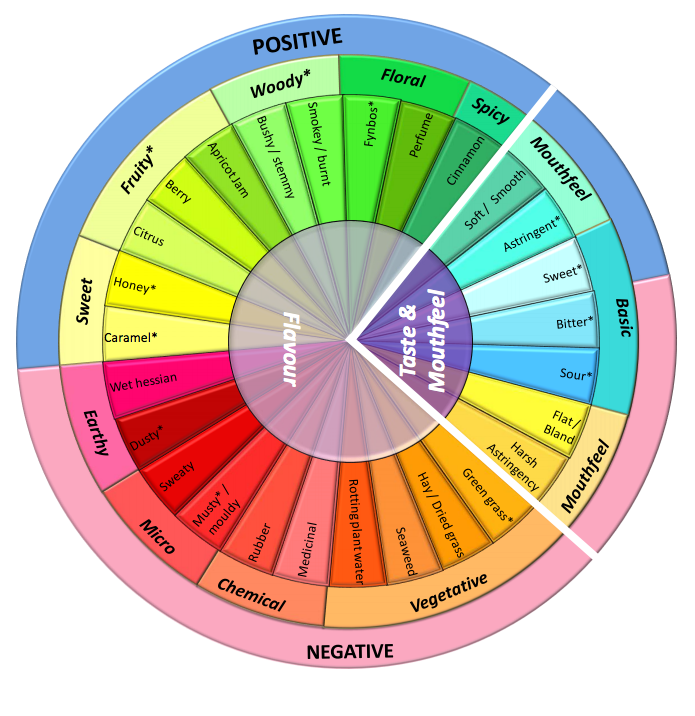 In 2012 they came up with a flavor wheel that you can use to determine the quality of the rooibos you've just steeped — flavors like sweet, woody, fruity and floral are good qualities in red tea, and earthy, vegetal or astringent tastes are negative qualities.